Oil giant TransCanada will not renew its contract with PR firm Edelman after its communications strategy was leaked last week, sparking controversy. The Calgary-based pipeline maker wants to build a new 4,600-kilometre, $12 billion network through Quebec and New Brunswick. This project, called Energy East, has received substantial resistance in the province. To counter this pushback, Edelman devised a plan to win over critics. “We will work with third parties and arm them with the information they need to pressure opponents and distract them from their mission,” the document, leaked by Greenpeace Canada, said. The company said it will “start a fresh conversation with shareholders,” but did not mention specifics. The pipeline would carry up to 1.1 million barrels of crude from the Alberta oilsands to terminals in Quebec and New Brunswick. Although few details are known at this point, the City of Estevan says there is no danger to the public following a train derailment this morning. Four tanker cars containing crude oil left the track at around 11 a.m. The incident occurred east of the CP Rail oil transloading facility and just north of the Devonian industrial subdivision. Fornwald said Transport Canada is en route to Estevan and will be conducting an investigation into the derailment. The City is asking that the public stay away from the scene and allow emergency services and CP Rail clear access. A cause for the derailment is not known at this time. It occurred on a low speed section of track and was not directly at the transloading facility which has been a source of concern and controversy since it opened in late 2011. Fornwald added two businesses adjacent to the tracks were evacuated immediately after the derailment while Fire Rescue Services and CP personnel assessed the scene. This is the first derailment in Estevan since 2004. 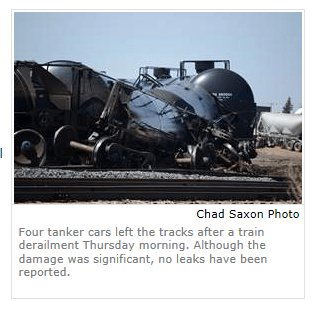 In that case, rail cars containing ammonia derailed and forced an evacuation of homes in the immediate area.